I’ve always been fascinated by advanced polymeric materials; it’s amazing how materials that are generally considered “plastics” have such stunning properties. I recently watched a couple of movies about Batman and it came out that some of his devices and protections are made of advanced polymers. In particular, the suit is almost entirely made of Kevlar. That material offers great protection against virtually everything. The movie tends to exaggerate a little bit, but Kevlar is actually a material that features striking properties. In this blog I would like to make a short introduction about the story, structure and properties of Kevlar. Kevlar was developed in DuPont labs in the 60s, by Stephanie Kwolek. During that time, DuPont was working on a new material featuring the same heat-resistance of asbestos and the stiffness of glass. A nice option in order to develop that kind of material was to use the stiff chains of aromatic polyamides. 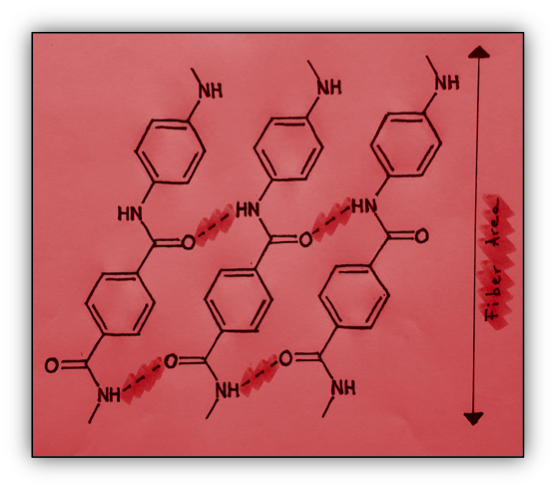 These polymers tend to be extremely insoluble in several solvents and their processability could be quite difficult. That was due to the presence of aromatic rings that tend to make the structure quite rigid and poorly flexible in terms of molecular motion. During their experiments, DuPont’s scientists obtained a low-viscosity polymer solution which was quite opaque and cloudy. In a polymer chemistry lab, a solution like that is normally thrown away; in fact, proper polymer solutions are transparent and have a quite high-viscosity. In addition, it wasn’t possible to clarify the solution by heating or filtration. Despite the expected disappointment, the solution obtained was tested in order to get a fiber. The results were amazing. Not only did the fibers spin well but they also were superb in terms of mechanical properties. The reaction which leads to the formation of Kevlar is shown in Figure 1. Figure 1 -Condensation between 1,4-phenylene-diamine and terephthaloyl chloride to give Kevlar. Keep in mind that the reaction above is that used currently (it can involve the use of terephthalic acid instead of the acyl chloride). In fact, the DuPont research team spent years in order to develop the final process. In the beginning, the reaction for obtaining Kevlar was carried out by polymerization of p-aminobenzoic acid. The process was costly though and it did need an understanding of the chemistry behind it as well. Eventually, the DuPont team came up with new procedures along with new challenges. Even though a new and less costly reaction was developed and carried out in hexamethylphosphoramide (HMPA) solvent, DuPont found this solvent to be carcinogenic. A new task to accomplish came up: finding a safe solvent able to give a material whose properties were not compromised. Finally, the combination of N-methylpyrrolidone and calcium chloride was selected as the best solvent. However, in order to obtain high properties fibers, the spinning solvent had to be 100% sulphuric acid. The corrosive properties and the high viscosity of the solutions involved were a concern but, DuPont research scientist Herbert Blades was still able to solve that problem. He found out that the polymer and the sulphuric acid form a crystalline complex, at a polymer concentration of 20%, which would melt around 70°C. That solution allowed the fibers to be spun at higher polymer concentrations (previous values were around 10-12%).1 In the end, the multidisciplinary approach that DuPont had eventually given to the research was the winning hand. Finally, full commercialization took off in the early 80s. In terms of chemistry, Kevlar is an aramid, short for aromatic polyamide. The reason for the name is easily seen by refering back to Figure 1. In fact, its repeating unit features an aromatic ring and an amide bond. The high-performance properties of Kevlar come from its reduced molecular motion even in the solution state. Macromolecules like nylon or polyester are quite flexible systems. Therefore, they tend to form random coils in the solution, with a certain level of entanglement. Spinning processes actually promote orientation of the chains as well as a partial extension of them. On the other hand, aramide molecules are particularly rigid and they have a rod-like behaviour even at low concentration. At higher concentrations, the chains are forced to align in parallel giving rise to a liquid crystalline domain.2,3 Because of that, the spinning process leads to complete extension of the chain. That situation is represented in Figure 2. 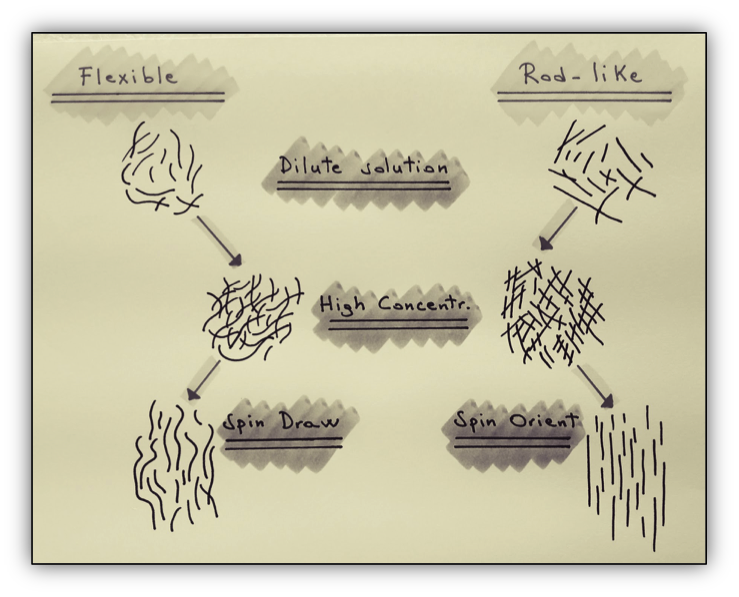 Figure 2 - Behaviour of flexible and rod-like macromolecules during spinning process. Since Kevlar feature high drawability, all its fibers have high tenacity and high tensile modulus along with a high heat resistance. All these properties are actually consequences of its molecular structure. In fact, due to the para-orientation of the aromatic rings, the chains form planar sheet systems which are actually locked together via hydrogen-bonds (see Figure 3). Additional strength is given by the interaction of aromatic rings which tend to be stacked up. Figure 3 - Representation of a Kevlar fiber. This level of three-dimensional order had never been observed in a fiber before. Its molecular orientation is parallel to the fiber axis and it features a defined crystalline packing.4 Compared to other kind of materials, Kevlar has amazing mechanical properties (see Table 1). It’s clear that in terms of Specific density, polymeric materials are the right choice if you are looking for light materials. Steel wire has higher Modulus; however, its Break elongation is quite small compared to the polymeric materials. Even though Nylon 66 and Polyester have better Break Elongation properties, Kevlar features much higher Tenacity and Modulus. Furthermore, its combustibility is quite low. Its fibers are difficult to be ignited and they do not feed the flame. It is a good thermal insulating material as well (almost non-conductive).6 Of course, everything depends on the final application. In any case we can say that Kevlar is a tough material which can be applied in advanced technology fields as a replacement for more heavy materials such as glass and metals since it is strong and light at the same time. Kevlar also features stunning thermal properties. In fact, it decomposes (with no melting) at high temperatures. That result is shown in Graph 1. In a Thermogravimetric Analysis (TGA), a sample is heated a constant heating rate and the weight loss is recorded over time. As you can see, this particular sample of Kevlar starts off losing a significant weight at around 500 °C. On the other hand, Nylon 66 and Polyester start off around 250 °C. 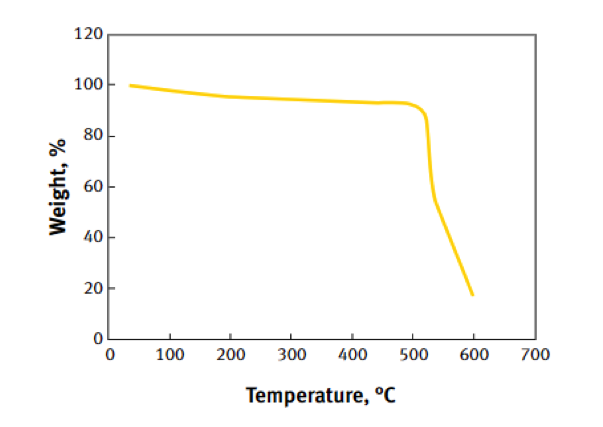 Furthermore, Kevlar remains stable below 180 °C for long periods. Even though Kevlar is virtually stable in every condition, it lacks of chemical resistance after exposure to strong acids and bases and its compression properties are not as good as its tensile properties. It is not affected by low temperatures. It remains unchanged although it is exposed to hot water for long periods. It’s virtually stable towards any kind of organic solvent. I hope you like this short review. I think it may be useful if you want to introduce new topics in your classes even though I have barely scratched the surface of this topic. Furthermore, concepts like Tenacity, Modulus, Thermogravimetric analysis etc., are often studied in Industrial Chemistry courses. Though, even a rough understanding of those concepts, really gives you the idea of how the chemical/physical properties of Kevlar and advanced materials in general, can be related to the chemistry and the physics behind them. 2 - P. J. Flory, Adv. Polym. Sci. 59 (1984) 1-36. 3 - S. P. Popkov, Adv. Polym. Sci. 59 (1984) 76-99.